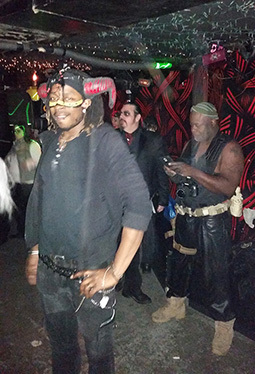 Every 4th Friday, for about the past five years, promoter and prominent scene personality Archangel Santana puts on a dance-club event that is tied to what he calls “occult” movie themes, by which he means sci-fi, fantasy or horror. Last month it was “The Crow”. 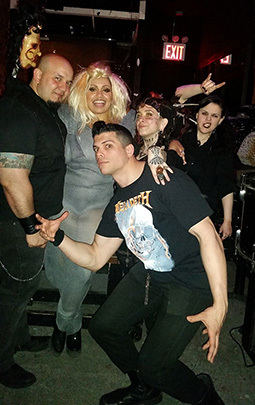 This night it was “Mad Max into the Thunderdome,” a recurring theme, but now partly in anticipation of the upcoming release of the remake of that famous cinema classic. 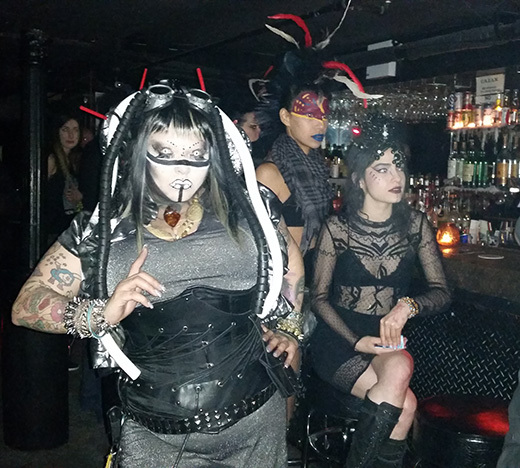 This night there was a Who’s Who of dark event personalities, starting with hosts Sir William Welles, of New Goth City website, and Gina Divine, the promoter’s wife. Statuesque beauty Miz Margo, a bi-coastal DJ, who is also famous for her position with NYC’s oddities boutique, Obscura Antiques, was present and had a special role to play. 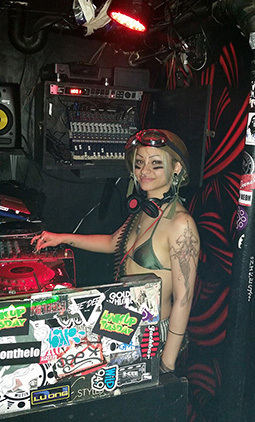 She announced and toasted her friend, one of the guest DJs, Hi-Fi Hillary for her birthday, and she distributed cake to those with an appetite for celebration. Regular DJs Aengel and V Christ were joined by guest DJs Paradox and birthday girl, Hi-Fi Hillary to keep the upstairs lounge interesting and the downstairs dance floor moving with everything from 80s to Scandinavian EBM. 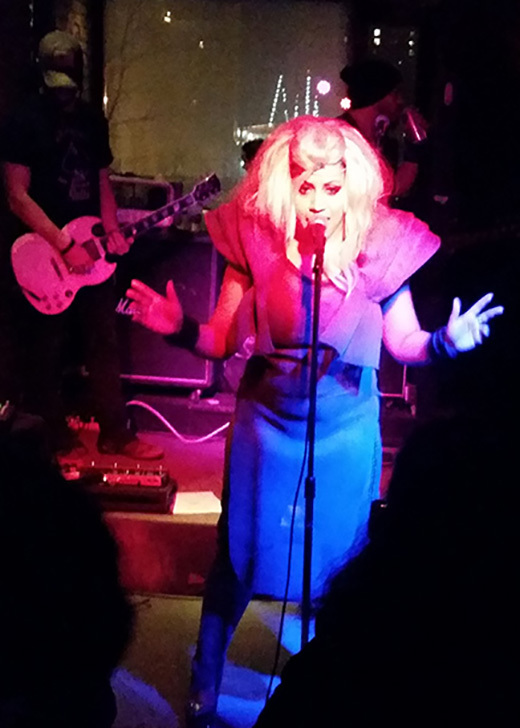 Upstairs saw a live performance by full-throated vocalist Militia Vox, formerly of all-female tribute band Judas Priestess, who could have passed for Tina Turner not only by her outfit, but by the intensity of her performance. Attendees, but not all, in deference to the theme, donned dark, post-apocalyptic costumes and make-up, although there was no enforced dress-code. 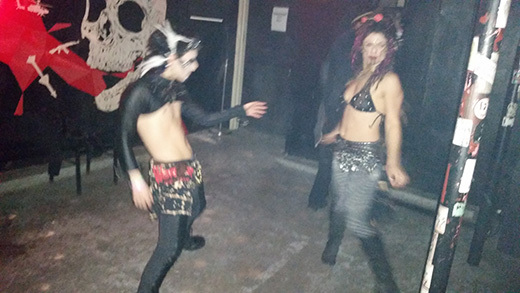 Downstairs saw both elaborately attired dancers and those in basic black rock the dance floor into the wee hours and imbibing from a well stocked and courteously manned bar. 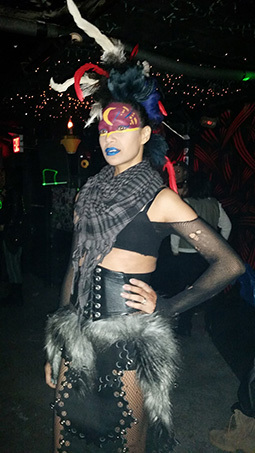 A team called Post Apocalyptic Warlords was responsible for the staff’s thematic wardrobes. Colorful, sometimes full-face make-up, complicated headdresses and extensions of metal, rubber and leather were worn by the crew and by visitors. Archangel moved about with an extra head towering on an extension above the one that he was born with. 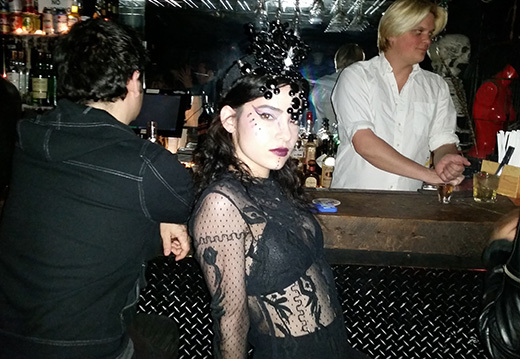 Archangel’s policy is to maintain an open, friendly welcome, in order to serve as an attractive entry event for newcomers as well as those deeply committed to the New York nightlife and Goth music scene. At that, I would say, he definitely succeeds.